MyPillow is not an anti-snoring pillow. It is designed with comfort in mind. It can provide better neck and head support that may result in a reduction in snoring levels. However, positive effects on snoring are not guaranteed. The quest to find a better night’s rest is a journey that all of us know too well. Unfortunately, something as simple sounding as a good night of sleep can be incredibly elusive. This journey is twice as hard for individuals who struggle with snoring or other sleep-related issues. Mike Lindell is the creator of the patented MyPillow sleeping pillow, advertised as the most comfortable pillow in the world. His decision to create the perfect pillow came from his own problems in childhood trying to get a solid night’s rest. Lindell points out how he would be constantly twisting and turning during his sleep, always adjusting in order to try and find comfort. Knowing how much he struggled with sleep, Mr. Lindell decided to do something about it. Mike would create the first MyPillow in 2004 after spending over a year perfecting the design. Now, MyPillow is seen all over the television and in households around the world but one question remains: is it actually worth the premium price? Will the MyPillow sleeping aid actually help you rest? Keep on reading our thorough MyPillow Review in order to find out if this pillow is the right fit for you. When is a pillow more than just a pillow? When it’s MyPillow, of course. At a glance, it can be difficult to understand how the MyPillow sleeping aid is different from any regular pillow that you would pull off of the shelf of your local department store. Fortunately, we can take a little bit of time to look ‘inside’ of the pillow in order to reveal the secrets to a night of peace and tranquility. The MyPillow sleeping pillow can enhance your comfort by focusing on its interlocking fill. What is an interlocking fill? Well, the interlocking fill is the greatest feature that MyPillow offers and it is the key aspect that separates it from all of the other snoring pillows you’ll see on the market. With an interlocking fill, your head will be able to come to a comfortable resting position. The interlocking fill adjusts to the user, meaning that your neck will always be perfectly aligned. When your neck is properly aligned, you are able to reach the depths of comfortable sleep faster. Getting to sleep faster means that you’ll spend less time tossing and turning, so you’ll end up falling asleep faster and staying asleep longer. Interlocking Fill – Keeping your neck comfortable is the most important job that your pillow will have. MyPillow is designed to accommodate the weight of your head, thus allowing your neck to stay perfectly aligned. When your neck is perfectly aligned, you fall asleep faster and stay asleep longer. REM Cycle – If you’ve ever woken up during your REM cycle, you’ll certainly remember it. A broken REM cycle will leave you feeling groggy and dissatisfied. MyPillow allows you to enter into your REM cycle without the fear of waking up due to tossing and turning. Snoring Aid – We’ll discuss this more at a later point, but we should highlight the fact that the MyPillow sleeping pillow also helps people who struggle with snoring. While not marketed as an anti-snoring pillow, MyPillow is designed to allow you to maximize your comfort. When you are truly comfortable and your neck is properly aligned, snoring tends to be less of a problem. Alright, now that we’ve spent some time laying out how MyPillow works in a general sense, we can move on to a more elaborate discussion on the features of the supposed ‘most comfortable pillow in the world’. As we’ve highlighted earlier in our MyPillow review, it can be hard to tell MyPillow apart from other similarly designed pillows. With that being said, there is actually quite a bit going on with MyPillow that is not rapidly apparent at first glance. Mike Lindell spent over a year perfecting each facet of his pillow and the quality can be felt in a number of different ways. Let’s go ahead and break down MyPillow in order to properly analyze the different features and designs of the sleeping aid. The MyPillow product is touted as the solution to all of your sleeping-related needs. The reason that MyPillow has become so popular is that it has mostly lived up to that promise through a variety of different design features. The first design feature, which we’ve touched on already, is the 3-piece interlocking fill. This feature allows for your head and neck to gently be cradled by the pillow. When your neck and head are firmly supported, in a comfortable fashion, you are able to enter into sleep quicker while staying asleep for longer. Additionally, MyPillow is touted for the fact that it never goes flat, no matter how often you use the pillow. In conventional pillows, you’d eventually see the product wear out and flatten over time. We’ve all seen pillows that have been overused and they are as uncomfortable as they look: limp, flat, and without much in the way of support. MyPillow is filled with shredded polyfoam and it is covered with a pure cotton outer layer. This combination allows for MyPillow to retain its shape, avoid going flat, and stay comfortable for a longer period of time. Finally, one of the greatest benefits of MyPillow is how easy it is to wash and keep clean. MyPillow can stay clean and fresh by following a machine wash and tumble dry routine. Treat your MyPillow like a pair of jeans and you’ll still have a pillow that retains its shape, comfort, and appearance. We can’t overstate how great it feels to have a pillow that can be regularly washed and cleaned without concerns of degradation. While MyPillow does quite a few things well, there are concerns regarding the lack of sizing options. 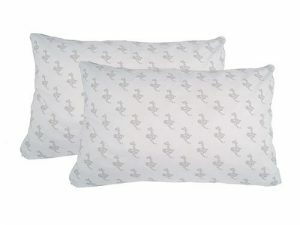 When shopping for a MyPillow, you are going to come across two primary sizes: King and Queen. The King sized MyPillow is 32″ long by 16.5″ wide. The Queen pillow is smaller, registering in at 26″ long and 16.5″ wide. While there aren’t many sizing options, Mr. Lindell does make up for it by offering different fill levels for customers who want to cater their pillow to their exact needs. Keep in mind that you can match any fill level with either the King or Queen sizes. Let’s go ahead and break down these different fill levels so that you can quickly pick out the right option for you. Yellow Fill – The least firm out of all the fill options. Lindell suggests ‘yellow’ rated MyPillows for young children and stomach sleepers. Lindell goes on to advise that yellow-rated pillows be used for shorter individuals or people with narrow shoulder width. White Fill – This is the ‘standard’ MyPillow fill size. The MyPillow chart suggests that people of average height/weight opt for the white fill. Taller individuals or folks with wider shoulders might have trouble with this fill size, however. Green Fill – The ‘green’ fill is considered perfect for most men and taller women. The green level is great for both side sleepers and wide-shouldered individuals. This fill will help to keep your neck properly elevated. Blue Fill – Finally, the ‘blue’ filling is perfect for taller and wider individuals. If you are over 6′ tall, then the blue pillow is going to be the only option for you. This pillow is the most padded of the bunch and it’ll help to keep heavier and taller individuals more comfortable throughout the night. While there are a variety of different fill options, comfort is ultimately going to be decided by your own personal taste. The colors above correspond to escalating firmness. Starting out with yellow, least firm, and ending in blue, most firm. If you know your own personal preferences, you can ignore the guidelines we laid out above. If you are not sure what exactly works best for you, stick with our guide and modify as you go. The goal of our MyPillow review is to supply you with the information you need in order to make an informed decision. When it comes to finding a pillow to sleep on, how it feels means more than anything else. If a pillow is stiff and scratchy, you probably aren’t going to enjoy actually sleeping on it. MyPillow has been touted as the most comfortable pillow in the world by numerous sources, but the question remains: can it live up to the hype? To start off, MyPillow is considered to be fairly soft in comparison to other premium pillows. The MyPillow sleeping pillow was designed to allow you to sink into the pillow while still retaining optimal support for both your head and neck. Mike Lindell hated having to deal with pillows that would lose their shape throughout the night and he made sure, via the interlocking fill, to prevent that from happening here. Outside of the softness of MyPillow, the pillow itself also remains relatively cool throughout the night. There is a reason as to why people prefer the ‘cool side of the pillow’ and it has everything to do with comfort. The MyPillow pillowcase is open-ended and the entire body of the pillow is made out of cotton. These two features combine to create a relatively comforting cooling effect which will reduce your own sweating while improving your overall comfort. While the interlocking fill provides great support for back and side sleepers, there are some relatively minor concerns to be heard if you like to sleep on your stomach. The lofted bulk of MyPillow makes it hard for stomach-sleepers to get comfortable. The height of the pillow and the lack of adaptability can mean that stomach sleepers will have trouble finding a position that is comfortable for them. Speaking of support, MyPillow shines most when sleepers are on their backs or their sides. The design of the pillow along with the patented 3-piece interlocking fill will allow customers to maintain their position throughout the night without the need for constant shuffling and adjustments. If you’ve slept with a pillow that skimped on support, you know the song-and-dance routine that is involved with repeatedly fluffing your pillow. Finally, inside of the pillow, customers will find a blend of shredded polyester foam. This foam gives MyPillow a comfortable amount of support while still giving enough ‘sink’ for customers to manipulate the pillow to their exact needs. The shredded poly foam seems to work well enough to assuage any doubts related to stiffness in the pillow. In fact, there were concerns that MyPillow would be too soft to provide the kind of support that Mike Lindell had been promising. Fortunately, it turns out that MyPillow manages to toe the line between soft comfort and rigid support. So far in our MyPillow review, we’ve managed to outline several features and points of comfort – but how does it help with your snoring? While MyPillow is not advertised as an anti-snoring pillow, there is a real reason to believe that it can actually help to stave off the troublesome habit. While many people view snoring as a minor and annoying habit, it can actually be a debilitating problem. People who snore can adversely affect their significant other and their own personal health. Snoring breaks your sleep cycle, destroys your ability to rest, and can slowly degrade your quality of life. It makes sense that people would want a pillow that can help combat the problem. So, does MyPillow combat snoring? As we already indicated in our MyPillow review, MyPillow can help to address snoring in a roundabout way. While there are many different reasons why people snore, one of the most common reasons is a lack of comfort and proper neck alignment. With the interlocking fill, MyPillow helps its users to keep their neck properly elevated throughout their entire night of rest. Maintaining this proper neck position can help to eliminate snoring. Additionally, snoring is caused by the simple problem of having restricted airways. When your head and neck are fully supported by MyPillow’s patented design, your airways stay loose and open. When your airways aren’t tightened and cramped due to an improper sleeping position, the likelihood of you snoring is diminished. Keeps Your Airways Unrestricted – By keeping your neck in a proper sleeping position, your airways will not end up restricted. Restricted airways are the leading cause of snoring in most individuals. Keeps You Asleep Longer – When you are truly comfortable, you’ll be less likely to snore. With proper neck alignment and premium comfort, you’ll be able to control your snoring at a better rate. While we have pointed out reasons that MyPillow can help your snoring problem, we have to make it clear that MyPillow is not specifically an anti-snoring pillow. There are anti-snoring benefits that MyPillow can offer, but they are not guaranteed to help all users. Go into your experience with MyPillow armed with the expectation that your snoring issues may be reduced but do not be surprised if they still remain. Ultimately, MyPillow is ideal for anyone who wants to take control of their sleeping habits. While there are pillows available on the market that have been specifically designed to treat certain medical conditions, such as snoring, MyPillow offers enough flexibility to address these issues while still remaining as a comfortable pillow for regular sleepers. MyPillow comes in a variety of different sizes and shapes and the interlocking fill makes it usable for just about anyone. The blend of comfort and functionality will likely make MyPillow a popular choice for people of all ages and body types. With that being said, MyPillow is particularly effective for individuals who suffer from sleep-related issues. 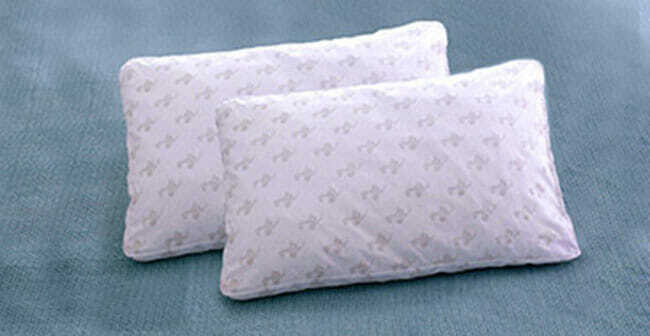 Snoring and mild insomnia due to discomfort can both be alleviated due to the features of MyPillow. No two people are going to feel exactly the same about a product, so it shouldn’t surprise anyone to see that there are varying viewpoints on the quality of MyPillow. We decided to comb through user reviews from around the Internet in order to get a representative feel of what people think of the pillow. We’ll start by looking at a few compliments before turning our attention toward a few of the negative comments. Complaints – While there were plenty of kind words about MyPillow, some customers did have issues. A prevailing problem among dissatisfied customers was the fact that you could not individually manipulate the fill level of your pillow. There is no zipper on the body of the pillow, so it becomes even more important that you order the perfect fill level. Other customers were dissatisfied by the inability to consistently use MyPillow while sleeping on their stomach. Stomach sleepers found MyPillow to be slightly too lofted for maximum comfort. As you can see, if you are planning on outfitting your entire bedroom with MyPillow products, then the 4-pack option is probably going to be your best bet. Regardless of your choice, MyPillow offers a 60-day money back guarantee to go along with a 10-year warranty. It’s pretty clear that Mike Lindell is focused on providing his customers with pricing flexibility. Ultimately, you are going to have to decide whether or not your rest is worth investing money into and that will determine if MyPillow is an appropriate solution for your needs. If you are still unsure if MyPillow is right for you, check out the key advantages and flaws of this snoring aid. When looking at MyPillow as a whole, it is easy to see that it is a product made by someone who cares. Mike Lindell’s story of his struggles to sleep is all too relatable for many people and you can tell he put effort into engineering a pillow to address this problem. MyPillow provides much in the way of comfort and design flexibility and the very tangible benefits of structural head-and-neck support are going to be hard to ignore for many people. While MyPillow is expensive at face value, the 4-pack special allows for customers to outfit their homes with great pillows at an affordable price. Our MyPillow review may paint a picture that this is not a perfect pillow, but we still believe the pillow does enough to warrant our recommendation. Our ratings are the result of an objective and independent evaluation of MyPillow, generating the final rating that reflects the overall quality of the company. Ratings may change as the product introduces changes. MyPillow user rating based on 6 user reviews. Did not help me stop snoring at all. It is more comfortable than most, but if you want to stop snoring, I don’t believe MyPillow will help you. It really helps me sleep better and I don’t wake up tired and in pain like I used to. The wife says I’m not snoring as much either. We found 0 verified MyPillow discounts for April, 2019. There are no MyPillow coupons or discounts right now. With our collection of MyPillow guides, you can have expert assistance every step of the way. We bring you all the key information you need to know before and after you purchase MyPillow, covering everything from MyPillow effectiveness, proper use and maintenance, and suitability for different types of snorers to cost and refund policy. Our collection of MyPillow guides is constantly expanded, so be sure to check back for more useful tips and instructions. MyPillow Fill Levels - which includes a helpful guide to choosing the fill level that perfectly suits your shoulder width and body frame. In order to be sure that MyPillow truly is the best solution for your snoring troubles, you need to know what makes it superior or inferior to its alternatives. Discover how MyPillow compares to other popular snoring aids of its kind with our detailed feature and price comparisons and easily determine whether you are making the right choice.